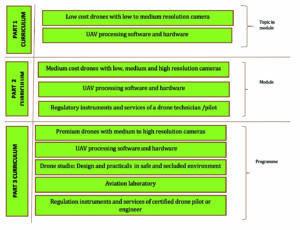 This article provides a strategy that can assist institutions in the development of appropriate curriculam for the incorporation of Unmanned aerial vehicles (UAVs) into geomatics or related studies. The International Society for Photogrammetry and Remote Sensing working group 7 (ISPRS WG V/7) proposed to develop unique computer-based educational materials that will integrate education in fundamental problems associated with geospatial data collection and training . This initiative was necessitated by some of the challenges identified in the training of modern civil engineers and architects, which include the inability of institutions to provide the learners with balanced geospatial science and technological education that adequately enables professionals to collect and process data. The geospatial sciences contribute to global economies through enabling the establishment of frameworks and tools for managing infrastructure and resources. The technologies involved are related to computer sciences (computer vision), robotics and other domains that also use spatial information. 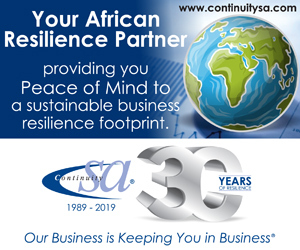 It is therefore important that there are strategies in place to support professional continuity through training. This article aims to provide a strategy that can assist institutions in the development of appropriate curricula for the incorporation of UAVs into geomatics or related studies. It presents a framework that can guide tertiary institutions offering a geospatial curriculum in their review initiatives towards the inclusion of UAV-related knowledge. The information can be useful in the skills and competency improvement for geomatics learners. 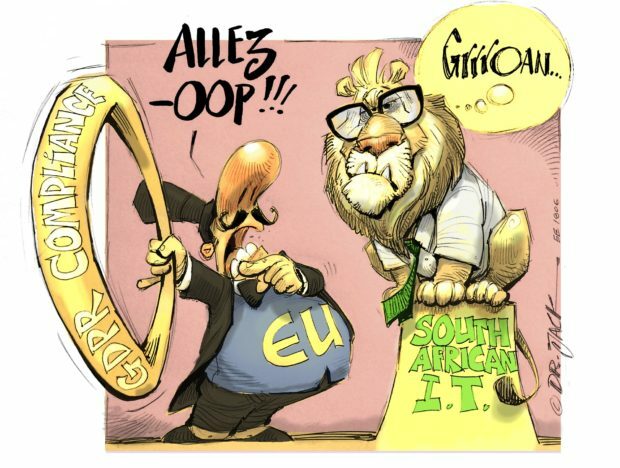 This article proposes a practical adoption model that is suitable for both developing and developed countries. Fig. 1: Knowledge building and planning phases. Undergraduate and postgraduate UAV studies primarily prepare learners to design, create, operate and administer UAVs and are mainly housed in engineering departments such as robotics, mechanical and electronics divisions. Geomaticians do not necessarily require such advanced UAV knowledge to become primary users of the technology in spatial applications. There is therefore a need to integrate knowledge on UAV technology into geomatics curricula in a manner that best suits the required body of knowledge appropriate for spatial learning. A three-phase design is used in the discussions. The three phases are knowledge building; planning and the method execution, analysis and evaluation. The first two phases include creation of capacity to meet the research objectives. The knowledge building phase is based on literature reviews and research objectives. The planning phase for this study includes preliminary research, data collection and user assessment. Fig. 1 summarises the principal considerations of the knowledge building and the planning phases. Fig. 2: UAV training needs of geomatics practitioners/learners. The research design used a statistical evaluation approach. Evaluation in education literature is defined as a systematic process of measuring the effects of capacity building initiatives . Education evaluation researchers have identified Kirkpatrick’s evaluation model to assist in analysing and recommending geomatics capacity building initiatives . This approach focuses on a four-tier investigation that analyses current training, market reactions and performance, and defines results. To align with the model, the researcher utilises probability sampling techniques (e.g. simple random, systematic, and stratified) to identify 30 random university portals online and review their current geomatics curriculum with specific focus on UAV-related components . Probability sampling techniques are less likely to suffer from bias than non-probability-based techniques. The infiltration of UAV technology into spatial applications has prompted some universities to introduce UAVs in their research and curriculam. This was initially done at a social level through UAV clubs within a university community and later through short courses, undergraduate degree and postgraduate education [5, 6]. Fig. 2 is a summary of the user needs review for geomaticians based on literature. Fig. 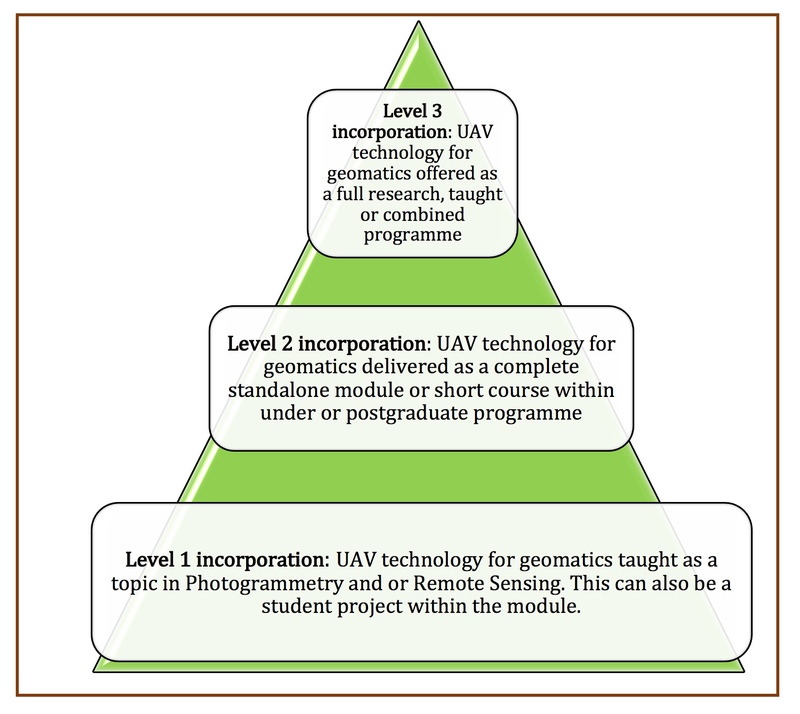 3: Three-tier model for incorporating UAV technology into geomatics curricula. Level 1: Data user with secondary data creation may simply require basic knowledge based on career path or personal interest in UAV awareness and the advances in technology. UAV usage may be minimal or not at all. 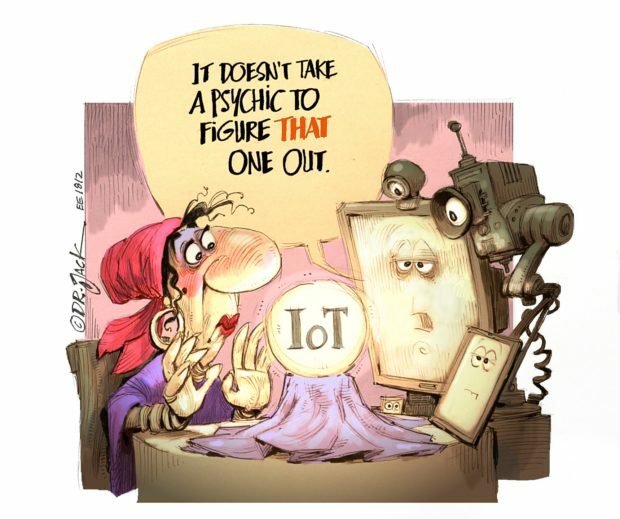 This user may be based in a non-fieldwork discipline or in the consumption of UAV-derived data rather that its generation, e.g. web and application programming, cartography, statistician, and GIS analyst. Level 2: Data user, creator and application. The intermediate user requires sound UAV knowledge as they utilise the technology in field work. This learner requires detailed knowledge of UAV systems and advances, e.g. photogrammetrist, remote sensing specialist, surveyor and archaeologist. Level 3: Data user, creator, application, problem solver and conceptual thinker. This user requires advanced knowledge of the application of UAV technology. This user applies UAVs extensively in their daily routine and is likely to be a conceptual thinker in the areas of application of UAV technology and its use for problem solving, e.g. senior photogrammetrist, remote sensing scientist and UAV surveyor. 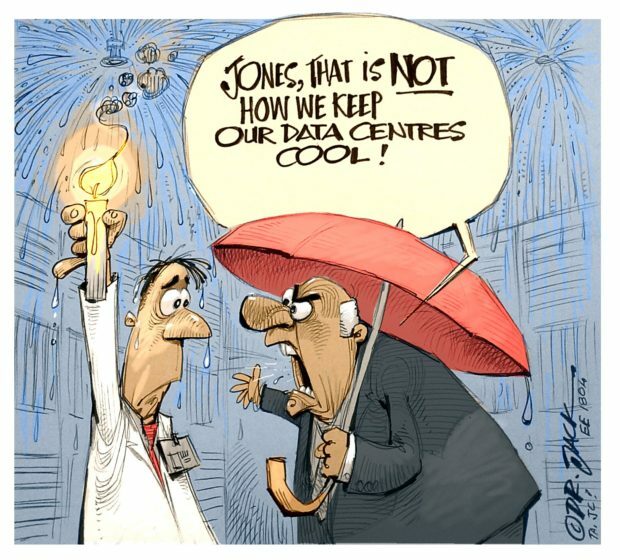 Level 1 incorporation can be implemented by the lecturer without having to change the curriculum. It simply includes covering UAVs as a topic in remote sensing or photogrammetry. This approach does not require highly detailed UAV knowledge but rather an overview of the technology and its application. Level 2 incorporation requires curriculum changes as it involves the introduction of a module on UAVs within the geomatics curriculum. The integration of this module requires the learners to have successfully passed photogrammetry and remote sensing principles so that they have an appreciation on flight planning and imaging. This adaptation requires a moderate understanding of UAV systems and their various applications in spatial sciences. Level 3 incorporation requires a complete development of a geomatics programme based on UAV technology. 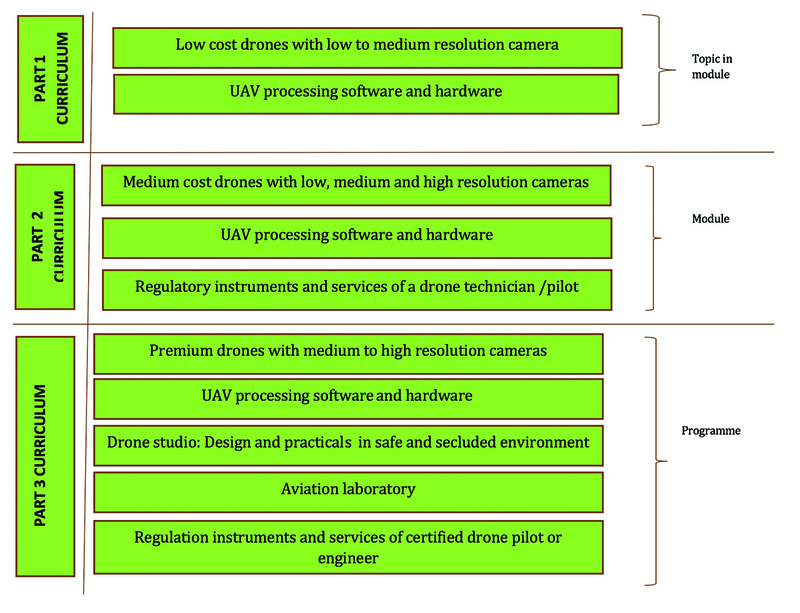 It requires significant software implementation and the customisation of the instruments (hardware and software) and creating connections between UAV use and image understanding. This level may currently not be very significant to practitioners at undergraduate level, but may be applicable in postgraduate studies. Level 3 incorporation however will find its place in undergraduate geomatics studies in the future as the popularity of UAVs increases. This level of adaptation requires an in-depth comprehension of UAV systems as applied to geotechnical problems. Fig. 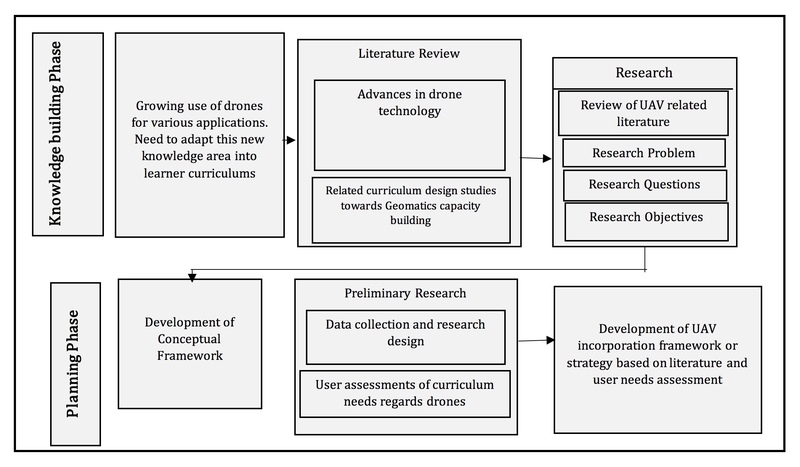 4: UAV curriculum implementation architecture. The training architecture outlined in Fig. 4 is recommended for the effective implementation of curriculum per level or tier. Depending on the tier, different assessment models can be appropriate. A first-tier assessment may include a method such as a presentation, written assignment, test or peer evaluation. Written assignment, test, practical UAV flying test or a short project may be ideal assessments for second tier curriculum. A level three curriculum is likely to constitute a combination of assessment methods across the different course components that can collectively contribute to a final programme grade. These assessments can range from presentations, assignments, tests, peer evaluation, short projects, practical assessments to design projects and a dissertation. The challenges that institutions may face in implementing this model may include financial constraints to purchase UAVs, inadequate staff skills, software requirements, institutional rigidness to effectively regulate curriculum changes as well as legal setbacks with most developing countries still lagging behind in accepting free use of UAVs for civilian applications. 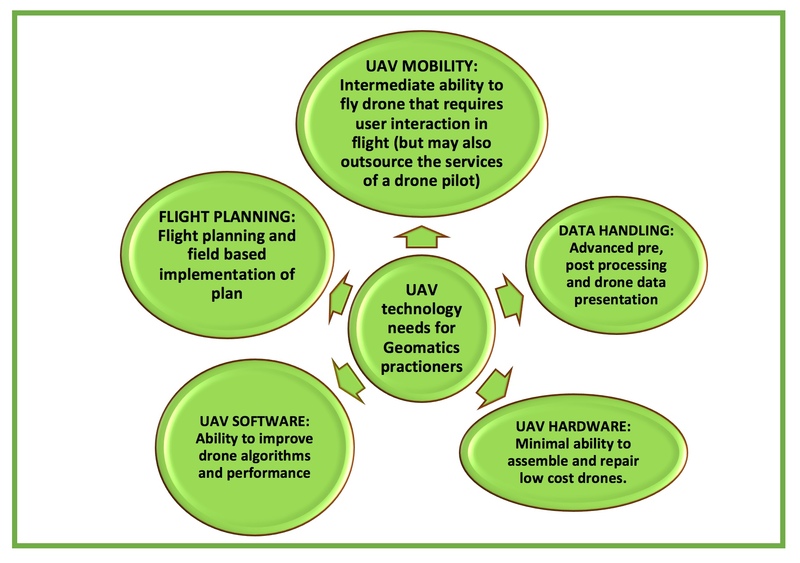 These challenges can be addressed through staff development, active research and lobbying to make stakeholders aware of benefits as well as opting for low-cost UAVs for teaching purposes. There is a range of UAVs on the market from approximately $250 which can be used for basic mapping work. More expensive brands can be purchased with time and financial ability. While the proposed models are not fixed, they provide useful guides for curriculum development. With frameworks such as these, the application of UAV technology in geomatics education can be greatly improved. The International Society for Photogrammetry and Remote Sensing Scientific Initiatives, 2017. Available at www.isprs.org/society/si/SI-2017. DL Kirpatrick, 1975. Evaluating training programmes, Third Edition, McGraw Hill Education, Berret Koehler Publishers. Available at www.bkconnection.com. C Montgomery, C Douglas, C Runger, 2010. Applied Statistics and probability for Engineers, Fifth Edition, John Wiley and Sons Incorporated Publishers; ISBN 13:978-0-470-05304-1. YA Aina, 2012. Applications of Geospatial Technologies for Practitioners: An Emerging Perspective of Geospatial Education, Emerging Informatics – Innovative Concepts and Applications, Prof. Shah Jahan Miah (Ed. ), ISBN: 978-953-51-0514-5, InTech. Available at www.intechopen.com/books/emerging-informatics-innovative-concepts-and-applications/applications-ofgeospatial-technologies-for-practitioners-an-emerging-perspective-of-geospatial-educ. R Al-Tahir, 2015. Integrating UAV Into Geomatics Curriculum in The International Archives of the Photogrammetry, Remote Sensing and Spatial Information Sciences, Volume XL-1/W4, 2015 International Conference on Unmanned Aerial Vehicles in Geomatics, 30 August to 2 September 2015, Toronto, Canada.